Religion and faith were powerful parts of the Middle Ages, and even emperors and their empires could not escape the grasp of the Church. 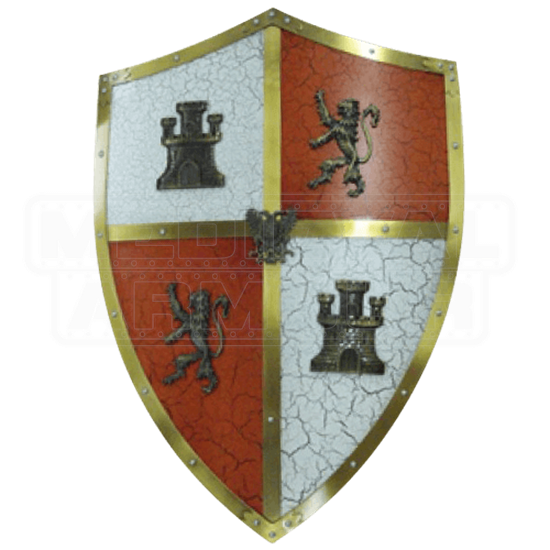 This Shield of the Catholic King is a heraldic defender fit for an emperor who fights for both faith and fealty. The shield is colorfully crafted in fine metal and richly adorned with a quartered field in red and white. The fields are crackled for a stylized look and divided with brass separators. Both white fields feature castle emblems while both red fields feature rampant lions. Set at the center of the shield is a small heraldic eagle with two heads (the classic heraldry of the Holy Roman Empire). Whether you carry it at your side or hang it in your hall, this Shield of the Catholic King brings the glory of the Holy Roman Empire to you, to use as you see fit.